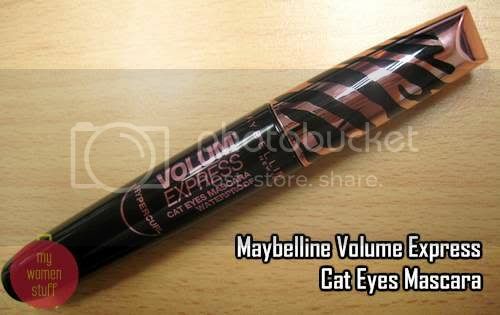 Home » Eyes » Eyeshadow » Maybelline Volume Express Hypercurl Cat Eyes Mascara – meow! Maybelline Volume Express Hypercurl Cat Eyes Mascara – meow! A couple of months ago, I came upon an ad in the Singapore Straits Times paper for a Maybelline mascara with a comb. I was intrigued. It reminded me of all those Japanese mascaras that come with a comb unlike the traditional brush. I wondered how it worked or how it’d fare but try as I might, we couldn’t get it here in Malaysia. Well we will now! I have since seen it in Watson’s retailing for RM33.90 The mascara comes in a pink and black tube – pink isn’t me sorry but I’d forgive that to see how the comb wand works. The comb wand looks like a erm… comb and functions rather like a erm… comb. Imagine if you comb your lashes as you will comb your hair. That is what the Maybelline Volum’ Express Hypercurl Cat Eyes mascara, feels like. It takes some getting used to that I can say – no more wriggle at the root but gently comb up the lash. Unlike other Maybelline mascara I’ve tried, the formula does not feel as heavy on my lashes. But importantly, cat eyes! Do you get the cat eyes effect? I applied the mascara without first curling my lashes. There is a curling effect but it can be enhanced if you curl your lashes first to achieve the 75 degree curl as claimed. What is nice is that it is lovely for lower lashes! I usually have a lot of trouble applying mascara on my lower lashes because the big brush heads would cause smudging But the comb does it very nicely indeed. I did not even need to tidy up my look! Tip: When your Maybelline Cat Eyes mascara expires or dries up don’t throw it away. Keep the comb wand, wash it out and reuse it as a lash comb. Its awesome! 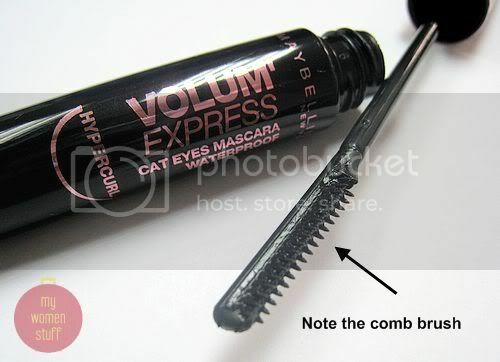 I got this tip from a Maybelline insider and sometimes when I use other mascara, I wipe off the mascara from the Cat Eyes Mascara comb and use it to de-clump and separate my lashes. Beautiful kitty!! The formula is supposed to be waterproof which it just manages to pass the test with less smudges throughout the day; and yes it cleans off quite easily with any regular makeup remover. So tell me – what do you use to create a cat eye look? I plan to use lots of black eyeliner winged out at the outer edge, black eyeshadow near the lashes and taken upwards, silver, grey or tawny colored eyeshadow on the lid and to highlight. Of course, not to mention lashings and lashings of mascara! Share your cat eye look with me on your blog or if you want to submit a picture, email me at parisb [at] mywomenstuff [dot] com by 13 May 2009 and I’ll upload a gallery in a week’s time together with my own look. 😀 It’ll be fun, come on! I was quite surprised at how it performed on the lashes. Wanna try the cat eye look? No need to use this mascara any one will do! I do not wear contact lenses. Other Maybelline mascara do not agree with my eyes – they don’t sting but the formula is too heavy and the chemical fumes are strong. This one is less irritating for me. You should try Majorlica’s one. The new version got a diff brush thingy on top and bottom of the brush head. This looks promising! The curling effect is impressive-wow! It would be better if you actually curled your lashes first. 🙂 Come on, share a look? I’m currently using Maybelline volume express, quite like the end result i’m getting. Also intend to try out Rimmel Glam Mascara a lot of good reviews. I’d heard good things about Rimmel too. So that might be the next drugstore splurge 🙂 You’re most welcome and I hope this helped you. i tried this mascara,i felt the comb pick up a little bit too much of mascara,it when on my lashes too thick and clumpy. I actually had little problem with this one. Perhaps try wiping off some excess on the side of the tube or with a bit of tissue before applying? It goes on less clumpy then. I’ve bought this too, and I love it (And the cat eye look in general)! XD It’s really easier to apply compared to conventional mascara (Which I find rather tricky, being quite a newbie at applying mascara), and it does lengthen and curl my lashes even when I didn’t curl them beforehand. My only ‘gripe’ would be that since my original lashes are already quite long, applying mascara makes my lashes push against my glasses and I have to wait until it dries (Which is quite fast, BTW) before putting on my glasses, or else I’d get marks on the lenses. It was also quite easy to remove for me. Can’t wait to see your look! I really love the Maybelline Volume Express Hypercurl Cat Eyes Mascara because in enhance my eyes! when its claimed to achieve 75 degree curl…well gurls its the truth! I just stop using this and switch to Revitalash mascara so far its doing good! For Cat’s eye mascara, they also have the brush type. The traditional type of mascara applicator. It costs half the price of this wand/comb type applicator.